Here at LaurenConrad.com, we believe that beauty begins from the inside out. We are always being mindful of what we put into our bodies to ensure that they stay strong and healthy, because to us, that is beautiful. We’ve also never been ones to shy away from trying a new detox or testing out a buzz-worthy health trend. That brings us to today’s topic. You’ve seen us rave about the benefits of Himalayan pink salt water, refreshing lemon water, and now we’re adding rose water to the list of infused sips on our radar. 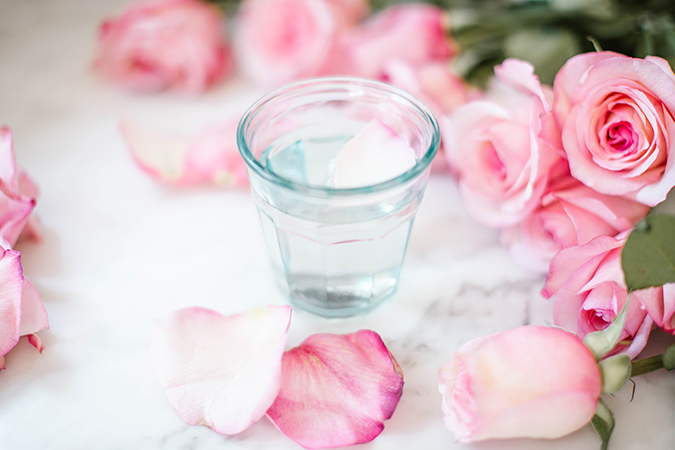 By adding rose water to your daily skincare regimen, you are doing so much more than keeping your face hydrated (which is also a pretty big bonus!). Rose water can help your skin maintain its pH balance by controlling excess oil production while keeping it supple and moisturized. Rose water is also known for its soothing elements which reduce redness and irritation linked to skin conditions such as eczema, acne and dermatitis. Rose water contains antibacterial and antifungal properties, allowing your skin to better heal scars and other wounds. We don’t know about you, but we’re always looking for natural remedies to improve our complexions. By applying rose water to your skin, you are cleansing, toning and even reducing fine lines and wrinkles. That sounds like a win-win to us! There are a few ways that you can incorporate rose water into your routine. Start your day by using rose water as a toner after washing your face by evenly distributing it with a cotton ball. You can even purchase a spray bottle and lightly mist your face throughout the day, with or without a full face of makeup. A little spritz here and there can be rejuvenating! Why you should be drinking rose water. In addition to adding this fragrant concoction into your beauty routine, consuming rose water also poses multiple benefits. Rose water contains vitamins A, C, E and B and contains anti-inflammatory qualities. It is also said that rose water can help reduce stress and moodiness (something we can all benefit from at some point or another, right?). If you’re looking for a fragrant and healthy way to stay hydrated, opt for a bottle of rose water the next time you’re at your local health food store. But like any health food fad, it’s always a good idea to ask your doctor if you have questions or concerns. How to make it at home. If you are interested in making rose water right in the comfort of your own home, you’re in luck! Making your own batch of fresh rose water is simpler than you think and we’ve got the recipe to prove it. 1. Begin by plucking the rose petals off of each stem and rinsing them thoroughly under warm water. It is important to note that you use organic roses, rather than the kind that you can just pick up at any grocery store. It’s best to steer clear of any harmful pesticides and any other chemicals that could have been used on the stems. 2. Place the rose petals into a large pot and pour just enough water in to cover all of the petals. 3. Boil the water and rose petals over medium-high heat. Once the water is boiling, cover the combination and reduce heat to a simmer. 4. Let the petals simmer for 30 minutes or until they begin to lose their vibrant color. 5. Remove the petals from the water with a strainer. 6. 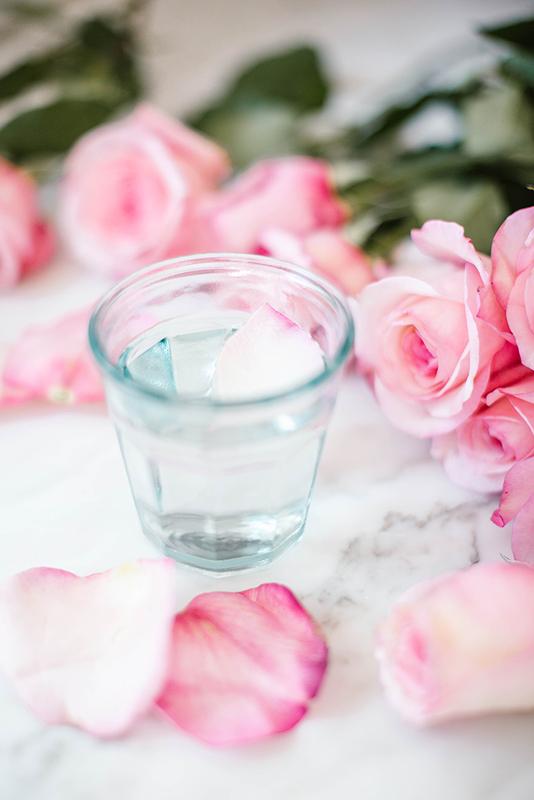 You now have your very own homemade rose water! Be sure to refrigerate or store your rose water in a cool place. Your homemade batch should last between 1 and 4 weeks. And there you have it! We’ve always been intrigued by rose water, and now we’re convinced that our beauty regimens can’t live without it. Have you ever tried using or drinking rose water?